If you’re one of the skeptics wondering why anyone would ever spend $829 for a glorified netbook that can’t even play Flash, prepare to multiply your disbelief. Although the iPad itself hasn’t even arrived yet, a diamond importer has already announced a diamond-studded version that will charge nearly $20,000 for. 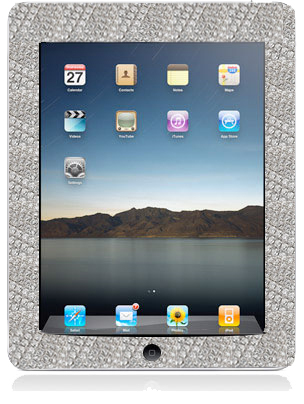 Mervis Diamond Importers now offers “the world’s first diamond iPad” for a rather steep $19,999. The princely ‘pad has been crusted with 11.43 carats worth of diamonds, hand set in the micro-pave style. For rock aficionados wondering just what they’re getting, the stones have been graded G/H for color and VS/Sl1 for clarity. The diamond-studded iPads will go on sale June 1 in “very limited” quantities. Mervis hasn’t divulged tech specs, but we had better hope they’re using the $829 version. We had also better hope the diamonds don’t roughen up the bezel too much for the dainty – possibly gloved – hands they’re sure to end up in. What do you do with a diamond-crusted iPad in another year when a better version comes out? The same thing you do with your diamond-crusted first-gen iPhone: Give it to your butler and buy a new one. Just make sure not to send it in for battery replacement in the meantime: You might be disappointed with the one you get back. Should You Buy the Apple iPad or Wait?